One of the many enjoyable aspects of Floydfest is the wine and beer garden at the Pink Floyd Garden Stage, a secluded enclosure to down a few drinks while still exposed to their outstanding musical line-up. On Saturday night, I happened to run into Ron Barker of the Virginia Wine and Cigar Trail, who was featuring Panacea Cigars from CigarVolante, LLC in a display near the stage. Ron's mission is to introduce Virginia wine lovers to cigar pairings where every wine has a suitable matching cigar. Even white wines. Ron selected the Black Maduro Grande to suit my medium strength preference and suggested I pair it with a medium bodied wine - preferably a Cabernet Franc or Pinot Noir. I shuffled over to the Chateau Morrisette tent and found a medium bodied Chambourcin (close enough). On its own, this is a smooth wine, low tannins, and very suitable for a summer festival. However, when paired with the Black Madur, the wine seemed to gain more body, nuttiness, and spice - while still retaining an easy drink-ability. Concurrently, the wine mellowed the cigar so that what little cigar burn was eliminated. Who knew? I can't wait to start pairing more wine and cigars - perhaps their Green Pennsylvania Broadleaf with Viognier or Sauvignon Blanc. Cheers. You know you may have a problem when on the day your son is flying home from Florida you frantically call his host to include two bottles of your favorite Florida wine, the Keel And Curley Winery Dry Blueberry. Now the original The United Grapes of America StarChefs.com article mentions wines from Schnebly Redland's Winery, but these tropical fruit based wines are generally too sweet for my tastes. On the other hand, the K&C blueberry is completely dry with a big nose and can be mistaken for a medium-full bodied malbec if one was tasting blind. 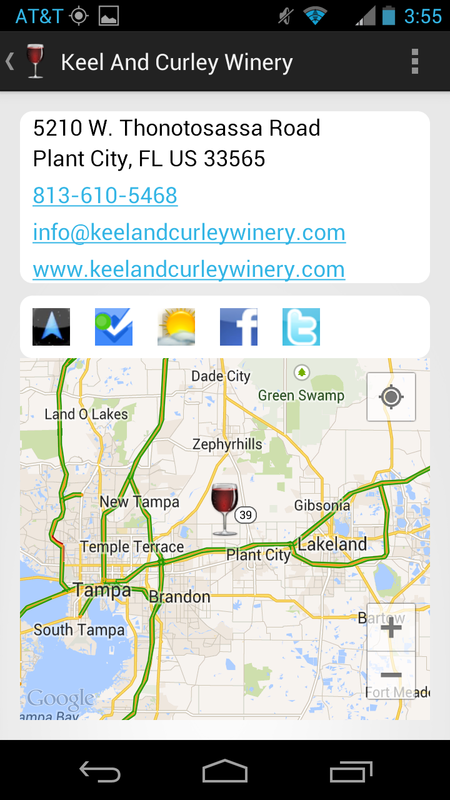 The wine is made from High-Bush Blueberries grown in their Plant City farm about 20 miles east of Tampa Bay. The blueberries are fermented on the skins which helps retain the key benefits of this super fruit: vitamin C and antioxidants. In fact a new University of Florida study fund that "wine made from southern highbush berries had more antioxidants than white wine and all but 20 percent of the reported values for red wines..." That could be why in 2011, 300,000 bottles of blueberry wine were sold throughout the Sunshine state. Glad I scored my two bottles. Cheers. Last week I visited northern Virginia's newest winery, The Winery at Bull Run, located adjacent to the Manassas National Battlefield Park. And this proximity to the park is what would draw history buffs as well as wine lovers to Centreville. The winery is located on the former Hillwood estate with ruins of the former mansion used as a patio. Parts of the First Battle of Bull Run (First Manassas) were near the Hillwood estate - most notably at the Stone Bridge - also adjacent to the winery and the southern part of the Park. With that in mind, proprietor Jon Hickox exhibits Civil War relics within the winery - some collected from the property and others donated by collectors. He also placed markers throughout the property describing the mansion and what the battlefield looked like from that location. The museum and markers are reason enough to visit this infant winery. As for the wines, their portfolio is produced using the Pearmund empire where the wines are made at either Pearmund Cellars, the Winery at La Grange, or Vint Hill Craft Winery. They are growing small amounts of Norton on the estate and source fruit from vineyards across Virginia. 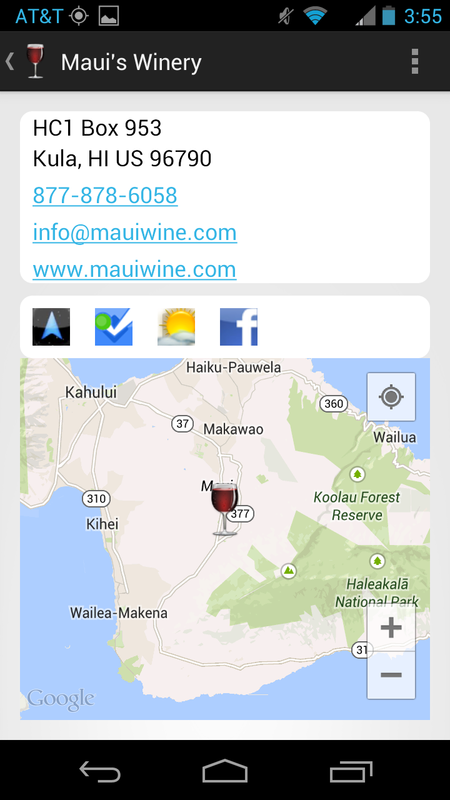 To their credit, the tasting sheets include the vineyard information. (I wish more wineries would follow this example.) For reds they offer a Merlot, Cabernet Franc, Meritage, and Norton; for whites, a Chardonnay, Viognier, a merlot based Rosé, and the "Delaney" - a blend of 40% Traminette, 30% Vidal Blanc, 20% Viognier, & 10% Riesling. Plus the "Fort", a Chambourcin port-styled dessert wine. For my tastes, the wines were okay. The chardonnay was typical Pearmund - more on the oaky side; the Viognier, oddly off-dry. The Delaney blend was spot on for those grapes as was the Norton, not over-acidic and jammy. These wines are pricey - you pay for the Pearmund winemakers and location: high 20s to $32 for the reds; $24-$27 for the whites; and $38 for the Fort. For me too expensive for everyday consumption but worth a bottle when soaking up the Civil War history. A few years ago I read an article called 50 beers to drink before you die and recognized a brewery I'd seen while driving to the Outer Banks, the Weeping Radish Farm Brewery. Their Black Radish (Schwarzbier) was listed and I had tried this dark German styled lager before and had always enjoyed that beer as well as that style. Last week I had a chance to visit the brewery while heading down to OBX. The facility is located in Jarvisburg NC, eleven miles north of the Wright Memorial Bridge leading into Kitty Hawk. Weeping Radish brews primarily German styled lagers and keeping with the Purity Law of 1516 (Reinheitsgebot), they utilize just water, hops, malt and yeast in the brewing process.They offer a range of styles from though out Germany, from Munich and Cologne (Kölsch) to Marzen and Weizen. During our visit we sampled their entire portfolio (seven beers) and all were spot on for their style. The OBX Kolsch was light and refreshing, the Corolla Gold (Munich Helles) was a little sweeter, and the Fest and Black Radish were right on. I definitely think a Schwarzbier is a style everyone should sample before they die - so why not the Black Radish - basically a milder form of Porter. The most interesting brew was the Radler - based on the Biermischgetränk (beer mixed with Lemonade or cola) - with this version mixed with Lemonade. The citrus flavor was mild and really was only apparent at the finish. It received mixed reviews with our crowd one pro and one preferring others. As the name applies, the Weeping Radish Farm Brewery is also a working farm. Goats range in front of the brewery and they provide a range of sausages and liverwurst. My favorite was the sweet potato wurst - with onions and bread - and paired with the Weizen - some sweet and sour flavors. All in all, this is a great place to stop on the drive down. The main complaint, the vessels sold to hold the beers are not very compatible for beach or pool drinking - 22oz bottles. Where are the cans? :) Cheers. Savage Oakes Vineyard and Winery opened almost a decade ago as Elmer and Holly Savage looked for ways to augment income from their Barrett Hill Farm. While principally raising Belted Galloway cattle, the couple also sold blueberries that grew wild in their fields. Since they had a natural source of fruit, Mr. Savage spent 4 years researching wine making and grapes that excel in northern climates. The family toured several wineries throughout Wisconsin, Minnesota, and New York to determine which grapes were suitable to Maine’s climate. They chose Seyval Blanc, Cayuga, Frontenac, St. Croix, St. Pepin, Leon Millot, and Maréchal Foch. Ironically, when the winery opened in May 2006, there were not enough wild blueberries to produce blueberry wine, which was the original impetuous for the winery. Instead the winery opened with five grape wines, with almost all produced from grapes grown in their vineyard. 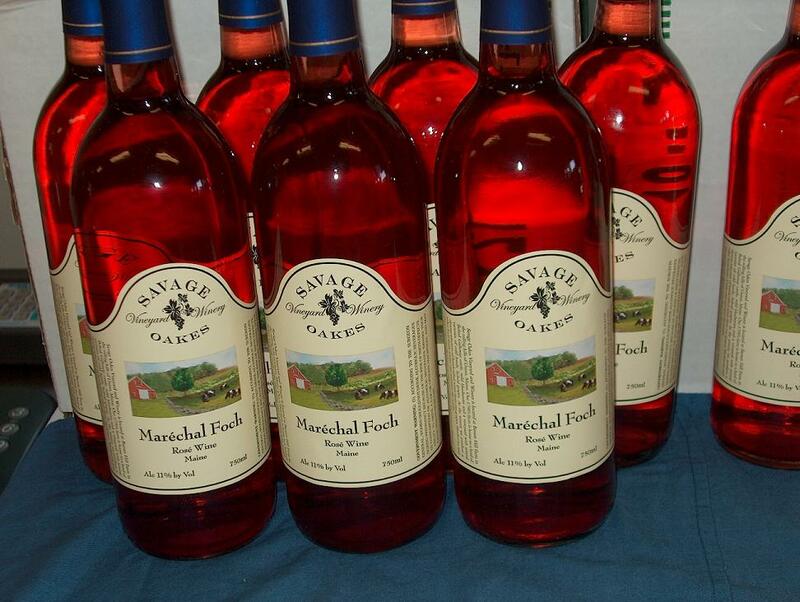 One of these was the Maréchal Foch Rosé. The grapes were cold pressed with little skin contact, then aged in stainless steel tanks. The result is a rather tasty wine that has the flavor profile and texture of the Foch grapes as well as being light and refreshing. Your summer picnic or pizza wine. Our next The United Grapes of America feature moves from this country's newest state to the oldest, Delaware, and Nassau Valley Vineyards, a winery that was listed in the original StarChefs.com post. Nassau Valley will be celebrating their twentieth anniversary next year and proprietor Peg Raley actually drafted the farm winery legislation that allowed wineries to operate in the First State. The estate is located near the popular seashore resorts of Lewes, Rehobeth, and Dewey Beach and receive plenty of tourist traffic. And being near the coast, the vinifera vines - yes vinifera (Cabernet Sauvignon, Merlot, Chardonnay, Cabernet Franc, and Petit Verdot) are planted in very sandy soil. This provides plenty of drainage and the sea breezes cool the grapes at night allowing for a decent diurnal variation. 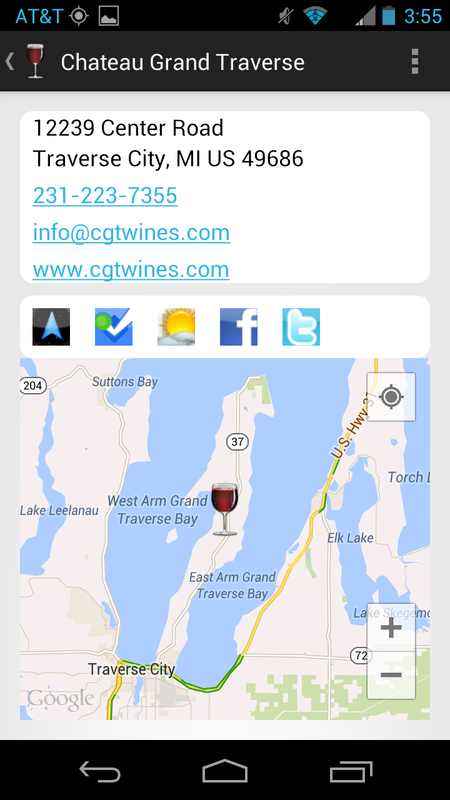 The "perfect" location for a vineyard. 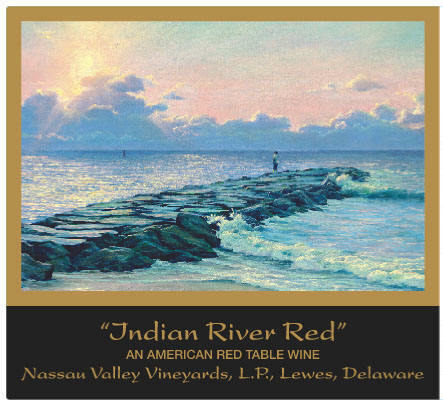 The winery produces single varietal wines from these grapes - the Chardonnay is my favorite of these - but their pride is the "Indian River Red" Vintner's Blend. Priced at $30.00, this is a blend of the estate's best fruit and for 2010 the blend consists of 73% Merlot, 17% Cabernet Franc and 10% Cabernet Sauvignon. The wine was then aged in French Oak for eight months. This is a big wine, earthy and leather, but also exuding dark cherry flavors. The tail contains some pepper and plenty of mouth drying tannins. This is the type of wine that really surprises you - made in a very unlikely area. Yet, if you can swallow the price - a nice example of a local wine. 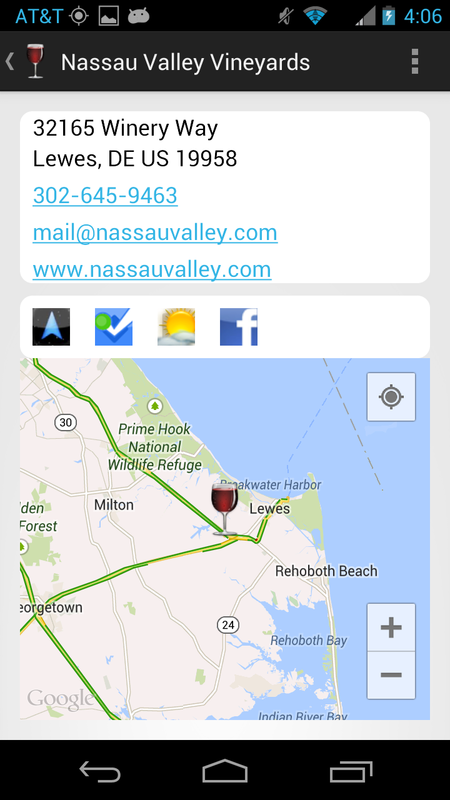 While driving along Rt54 into Fenwick Island Delaware, I noticed a parcel of vines planted in very sandy soils about 3 miles from the ocean. Looking around I saw a sign for Fenwick Wine Cellars across the street in a small shopping center. Could this be Delaware's third winery? Yes and no. Yes, the proprietors have planted Concord, Niagara, and Reliance on their farm; but no, the heavy work occurs in the family winery in Lake Erie, PA - Arrowhead Wine Cellars. Adrian Mobilia was raised on a 200-acre farm growing grapes, apples, cherries, and peaches. After graduating from Penn State with a degree in Horticulture he helped his father Nick plant vinifera grapes and launch to accompany their existing labrusca and hybrid vineyards and launch Arrowhead Wine Cellars. He eventually met an Ocean City native and he and Shannon decided to replicate the family business on the Delmarva coast. They planted the estate vineyard in 2010 and will soon be able to determine if the fruit will tolerate the salt laden sandy soil. 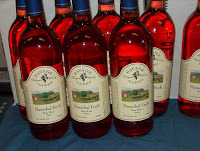 In the meanwhile the current Arrowhead wines are getting a makeover with Fenwick Wine Cellars labels. And that's quite a range of wines. There is a wine for every taste from sweet to dry; red to white to blush, fruit wines, and even slushies. Yea, that's a product I'm really not a fan of - but evidently the tourists that flock to the seashore have other thoughts. I really enjoyed tasting through their entire portfolio - not a bad deal either - $5 to sample 23 wines. And that included plenty of labrusca and hybrids like the aforementioned Concord and Niagara plus Steuben, Catawba, Fredonia, and Vignoles. Each of these wines were exactly what you would expect from that grape and brought back many memories of Pennsylvania wine festivals. My favorite reds where the Chambourcin and Reilly's Red (Lemberger) - right on again with these grapes. For whites, the Riesling was made in a very drinkable semi-dry style; but I couldn't resist the Reflections of Fenwick (Vidal-Chardonnay) housed in the Italian made commemorative lighthouse shaped bottle. That's the Fenwick Island Light, built in 1859. Yet the most fascinating wine is the High Tide/Port - produced exclusively from Concord (double fermented). First, you would never guess Concord was involved. No jammy grape flavors at all. Then, there is absolutely no burn because there was no fortification with grape brandy or grain spirits. Instead it has all the characteristics of a port - silky with plum flavors with a nutty finish. This wine alone is reason to return. Cheers. On the 4th I took time off from the beach to visit a new micro-brewery - Burley Oak Brewing Company - located in Berlin, Maryland only a few miles from the beaches in Ocean City. The brewery takes its name from local history. The name of the town is a shortened version of a local tavern "Burleigh Inn" - derived from the Burley Plantation - and the building housing the facility was once a cooperage - hence Burley Oak. Since opening in August 2011, owner Bryan Brushmiller has kept a continual supply of about a dozen beers on tap where consumers can sample by the pint or take home with growlers. I was a bit confused by this situation since the brewery isn't a restaurant and thought selling by the pint was illegal in Maryland. And yes it still is; except Brushmiller was able to get the Worcester County in Annapolis to carve out an exemption for Burley Oak so they could operate as a pub and not a restaurant. Nicely played. On my visit the brewery was pouring nine beers, plus a root beer, and was immediately impressed with the diversity of the offerings. There was a Kolsch, Pale Ale, Belgian Ale, IPA, Saison, Wit, Imperial Red, and a Milk Stout. Wow. And two of the beers, Pale Ryeder and SummaRye utilize local rye from Snow Hill. I included the later, a farmhouse saison, to my sample of four along with the Port d'Orange Wit, Cherry Poppins (Belgium Cherry Ale), and Black Cow Milk Stout. Through previous encounters I've found that milk stouts are excellent beach beers - the lactose infusion creates a creamy brew very compatible with excessive heat. The downside; the Burley Oak version is nitrogenized in the cask so is not available for growler sales. The SummaRye and Port d'Orange were each good examples of their respective styles and with low IBUs - another example of refreshing beach brews. But continuing my trend this summer, my favorite was the Cherry Poppins - a smooth ale with subtle hints of cherry - not overpowering so like a lambic - just nicely integrated. It reminded me of a concoction a bartender created for us at Fireworks Arlington, who blended the Allagash White with a small amount of Kasteel Rouge. Thus, I think we will be hitting Burley Oak two times each trip to the beach, once to fill growlers for our stay and then again on our return home. Cheers. One aspect of the wine and beer industry we find fascinating is the close collaboration between winemakers and brewers. This collaboration is manifested in several ways, such as the second vintage of "3". This wine consists of three grape varieties (Merlot, Petit Verdot, Cabernet Franc) grown on three different vineyards, and made into wine by three acclaimed winemakers. The Merlot was crafted by Matthieu Finot from King Family Vineyards, the Petit Verdot by Emily Pelton from Veritas Vineyards, and the Cabernet Franc by Jake Busching from Grace Estate Winery. Each winemaker selected two barrels and the "resulting blend is a wine with full proportion and balance which highlights the ripeness of the vintage". Tomorrow (July 3rd), King Family is hosting the official release party but each winery will have 45 cases for sale at $33.33 per bottle.